The end of a fun-filled Thursday at San Diego Comic-Con was a real highlight for me, and no doubt for more than a hundred Stargate fans who assembled for a special premiere screening on board the U.S.S. Midway! Docked in San Diego Harbor, the Midway now serves as a museum home to numerous military aircraft (including the SH-3 Sea King, a helicopter that recovered astronauts for five different Apollo missions). 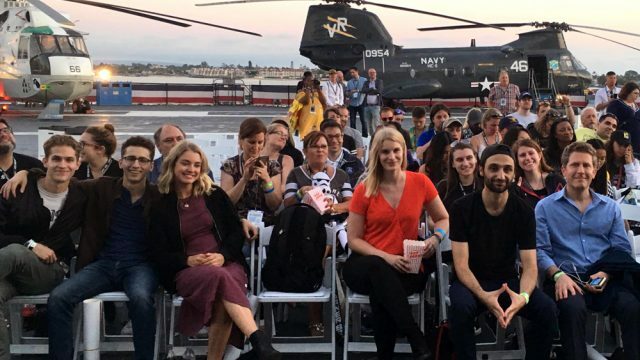 Gathering on the deck of the ship before sunset, fans had the opportunity to meet one another, take pictures, and mingle with the cast of Stargate Origins. On hand for the premiere screening of the feature cut (Stargate Origins: Catherine) were Ellie Gall (“Catherine”), Philip Alexander (“Beal”), Aylam Orian (“Brücke”), Shvan Aladdin (“Wasif”), Daniel Rashid (“Kasuf”), and Sarah Navratil (“Eva”). SG-1 favorite Tony Amendola (“Bra’tac”) was also there for the show, fresh from the Stargate panel event earlier in the day. And turning up in style was Christopher Judge — Stargate SG-1‘s Teal’c — who chatted up fans and posed for pictures. Chris Judge greets fans on board the Midway. With the sun down now the screen lit up, as MGM presented never-before-seen footage from the Stargate: Continuum premiere — featuring Ben Browder, Amanda Tapping, Michael Shanks, and the rest of the cast and crew of the 2008 film. Stargate Origins rolled next, and I have to say that it holds together a whole lot better as a single, continuous story in the “feature cut” format. And it was also a unique experience to enjoy the production alongside the cast. At the end of the night we posed for pictures with the Origins cast, who have really bonded with one another since the fall 2017 shoot. Fans lined up to receive Stargate Origins posters autographed by the cast … and the night was over. On Friday morning I’d have the chance to join Kieran, Chris, and Tony on a live-streaming conversation with Sam Maggs at the Nerdist House. And of course there’s lot of time to be spent wandering the Exhibit Hall, hanging out with friends, standing in lines, spotting actors and creative talent (I met Farscape‘s Gigi Edgley! ), and hitting the town at night. 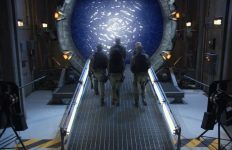 But Thursday was our big “Stargate Day,” and it was incredible fun with some tremendous people — fans, actors, and those who work day-in and day-out behind the scenes, and who really love Stargate and want to see it return in its full glory. 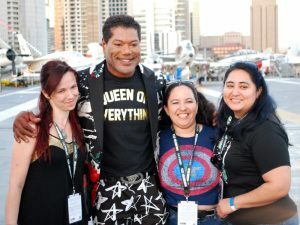 For more from my Comic-Con experience be sure to check out GateWorld SDCC 2018 photo gallery! As I live on the other side of the world in Tasmania I’ll not be attending, sadly. It’s a long, expensive trip. However, when I joined up to GateWorld recently (User name Schneiderhahn), I was promised a coupon to download a digital copy of Origins. So far this has not eventuated. Can you help? Or are there regional issues operating here? Though now some 80 years of age, I’ve been an avid fan since the year dot and am feeling very left out at the moment. 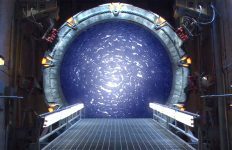 Hi, Schneiderhahn: The digital download coupon comes with the paid “All-Access” subscription to StargateCommand.co (and has nothing to do with us here at GateWorld). That’s currently limited to six countries, but Australia is on the list. If you have a paid membership at Stargate Command I’d suggest you inquire with their customer service folks about the download code!